Brewers are always interested in improving the flavor and aroma of their beer, and there seems to be an endless array of techniques by which to accomplish this. 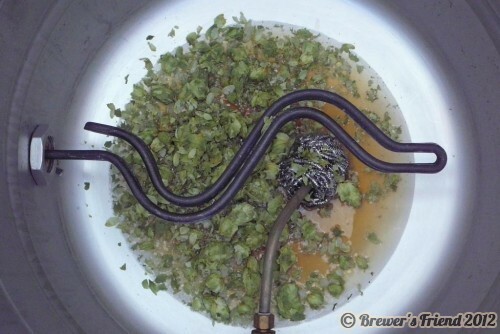 One technique that is receiving much attention is first wort hopping. Also known as, and referred to as, FWH in most brewing circles and software applications. First wort hopping is the method by which a hop addition is added to the boil kettle prior to lautering your grain bed. This allows the hop oils to steep in the 150F-160F wort during the lauter and then be boiled for the entire duration of the boil. There are complex reactions occurring in the hop oils during this low temperature steeping that are not well understood, but the effect is unmistakable. FIG 1. This process is well suited for beers where you would like to accentuate the hop aroma and flavor of your beer, for obvious reasons this is probably not a great match for a malty Marzen or malty Holiday Ale.. FWH’ing provides the beer with a much more refined bitterness and flavor, it is sometimes referred to as a “round” flavor, less sharp. Though the hop utilization is generally about 10% greater than a typical hop addition added at the beginning of the boil, the bittering perception is many times said to resemble that of a 20 minute hop addition. For this reason, FWH’ing generally does NOT take the place of your bittering hop additions. There are a few simple FWH’ing rules, but these are by no means limits to FHW’ing, just general guidelines. Do not alter your bittering additions, whether they be 60, or 90 minutes. The increased utilization is offset by the more refined bitterness and flavor of the addition. Use noble or low AA hops with a low cholumene level for FWH’ing. Some claim that high AA bittering hops utilized in this manner create a less pleasing flavor and bitterness than do low AA or noble hops. Use the recipes late addition hops (0-20 minute additions). The flavor and aroma from the FWH addition is a suitable substitute for these additions. Use approximately 30% of the total hop bill, for FWH. This 30% will constitute the 0-20 minute hop additions from the original recipe. The afore mentioned “rules” are a general guideline for FWH’ing, but they are by no means the limits of this method. I have brewed an APA that uses ONLY a FWH addition for bitterness and it is one of my favorite beers, so you can feel free to experiment. Until you feel comfortable with the FWHing technique, try the afore mentioned “rules” and then branch out once you get a feel for what it contributes to different beer styles. Partial mash and extract brewers can also experiment with FWH’ing in their beers!. The key here is to realize that the FWH is dependent on the hops steeping for a time in 150F-160F wort. In the case of a FWH’ed partial mash the hops could be added to the wort immediately after the grains are removed. Steep the hops for 20-30 minutes prior to the boil to mimic the time interval that would take place during an all grain lauter. After this steep, then boil as usual and make your usual hop additions. To use this method in 100% extract brewing you will have to heat the water + extract wort to 150F-160F and allow the hops to steep in this warm wort for nearly 20-30 minutes, this will closely mirror that of FWH’ing in an all grain brew. After this steep, then boil as usual and make your usual hop additions. Just to be sure I understand this. Mash as usuall, mashout and run-off into the boil kettle, add my late (20-0 min)hop additions, sparge and run-off as normal, once boil volume is reached, boil as normal. And skip the additions that would have gone in at the 20-0 min mark, as they were added First wort. In terms of the bitterness calculation – the IBU contribution is equivalent to a 20 minute boil. Since the hops are there for the full boil, the aromatic qualities would be boiled off. Think of FHW as a smoother bittering method. By adding the very late additions (0-5 minutes) so early aren’t you going to lose the aroma(which is why they are added so late)? Won’t that be boiled off or am I missing something here? Should you keep those later additions as scheduled so you get the aroma or will it still give enough aroma? They say first wort hopping gives a smoother bitterness. I use it for my lagers. For example with hops like Hallertau or Tettnanger. In that case its not aroma I’m going for, but maximization of the hop flavor. I think the chemistry of the warm wort with the hops does something to the way the flavors bind to the sugars during the boil – but I’m not a master chemist. There will be more boil off of the aromatic qualities with this approach. If you want aroma, go for the late addition. Got it and thanks for the help and the site. I just recently found it and I am really enjoying the articles. The checklists and calculators are very helpful as well. For an extract kit with steeping grains, would I steep first with the grains, then add the extract, then FWH for 20-30 mins? How about first wort hopping right off the bat with the steeping grains for 20-30 mins? Would this not result in the complex hop oil reactions that you want with FWH? 2) When steeping is done and wort is at 165F, add ~2 lb of extract (mix in well), then add the first wort hops. 3) Fire kettle to boiling and proceed as normal. This will give 10-20 minutes for the hops to soak in with the extract sugars. This approximates the time line for first wort hopping in an all-grain brewing process. For extract batches, I highly recommend saving the last 50-60% of extract for the last 10 minutes of the boil for lighter beers. I would use 30% of my total hop bill from my 0-20min (below example) and not my hop bill from 30-60min. Another question. Does your IBU cal (on site) have a space for FWH? I did not see it but just wanted to make sure i was not missing it. I read it will be ~10% Higher IBU. That is an interesting idea about FWH and bittering. Could you please refer us to your source regarding FWH leading to a 10% higher IBU? The boil time is in theory the same. If anything the first wort hops are soaking in steaming wort until the boil starts, which will carry away some of the alpha and beta acids through evaporation. I bet that is why there is less bittering potential. I need to update the IBU calculator for Brewing In A Bag, and for First Wort Hopping. I think i saved the other sites that talks about the ~10% increase in the ibu for fwh. A couple of sites state that most people do not notice the ~10% increase. Did my 30% of my 0-20mins sound ok. I think you are on the right track there, in terms of FWHing with your aromatic hops. You’ll have to dial it in for your taste. I’ve added the 10% boost idea for FWH to my ‘todo’ list on the IBU calculator.